In the pantheon of truly great original superheroes, there are Superman, Batman, Wonder Woman, Spider-Man, and the Hulk, and one other that is far less well known today: Captain Marvel. In his heyday in the 1940s, the good Captain outsold every other superhero, including Superman, and launched a vast line of comics and merchandise, as well as a decade-spanning lawsuit that ultimately brought his entire empire crashing down. By 1940, Fawcett Comics was already one of the top publishing houses in the country, and sensing that comics were becoming the next big thing, the company decided to bring out its own superhero. Calling on staff writer Bill Parker, Fawcett initially wanted him to create six heroes, each with a different attribute, but later decided to combine all six powers into one person. Another staff member, Charles Clarence (“C. C.”) Beck, was recruited from the humor magazine department, and in February 1940, Captain Marvel was born in the pages of Whiz Comics. The first story opens with young, orphaned newspaper seller, Billy Batson, being summoned by a stranger into a nearby subway station, and in short order the boy is whisked by subway car to the end of a tunnel. Once there, the lad is confronted by a long-bearded wizard named Shazam, who has been hanging around for 3,000 years protecting the world from evil. He declares that it is now Batson’s turn, and when the boy repeats the wizard’s name, “Shazam!”, he is transformed into a red-suited, adult man with rippling muscles, a white cape, gold boots, and a lighting-flash design on his chest. The wizard instructs him that he now possesses six great powers: wisdom from Solomon, strength from Hercules, stamina from Atlas, power from Zeus, courage from Achilles, and speed from Mercury (the initials of each “donor” conveniently forming the magic word, Shazam!). Whenever Captain Marvel wishes to resume the form of Batson, he need only repeat the word and the reverse transformation will occur. Thrilled with his new body and seemingly limitless powers, the Captain travels back to the surface, failing to see the falling block of granite that inconveniently squashes the old man. Still, he need not worry, since Shazam would reappear at various points over the coming decade, seemingly none the worse for wear. In no time at all, Captain Marvel met and defeated his first foe, the bald-headed mad scientist Dr. Sivana (in the first of many, many such battles), and as Billy Batson, he had gained a job as a radio announcer at station WHIZ. The story and art were direct, simple, and charming, and the readers loved the strip. While Superman’s stories were ostensibly serious and science-based, Captain Marvel was a creation of magic, and literally anything could happen in his adventures. They were also underpinned by a wry sense of humor, as was soon proved by the introduction of the bumbling would-be superheroes, the Lieutenant Marvels. More importantly, the Captain (or “the Big Red Cheese” as he was nicknamed by Sivana) was every boy’s wish made flesh. Superman and Batman were resolutely grown-ups, but Billy Batson was a kid just like his readers—apart from being able to change into a dashing superhero (a sort of omnipotent big brother or uncle figure) at the drop of a magic word. Why relate to a sidekick like Robin when you can imagine being the real thing? Almost immediately, sales were colossal, and in early 1941, Captain Marvel was given his own title. 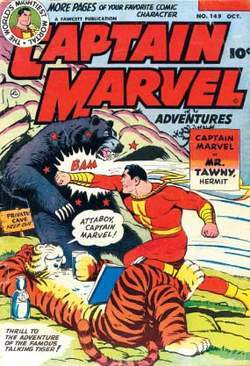 Soon after, two spin-off characters, Captain Marvel Jr. and Mary Marvel, began appearing in other Fawcett comics. Later still, that pair spun off into their own books, while Captain Marvel himself began to crop up in such comics as All Hero and America’s Greatest Comics. Then, in 1945, all three characters starred together in Marvel Family. By 1943, their combined titles were selling almost 3 million copies a month and the Captain Marvel comic itself was appearing twice a month. At its peak, two years later, the comic was selling an amazing 1.3 million copies per issue, and was by a substantial margin the most successful superhero comic on the stands. Binder and Beck’s finest hour was undoubtedly a serial that ran in the pages of Whiz Comics for two years during the darkest days of the war: “The Monster Society of Evil.” The tale introduced an evil criminal genius named Mr. Mind, who gathered together a group of villains—including Sivana, Captain Nazi, Mr. Banjo (now there’s a name to conjure with! ), King Kull, and Ibac—to do battle with the Big Red Cheese. In a masterstroke that could only have worked in Captain Marvel stories, Mr. Mind turned out to be a particularly devious worm, much to the amazed delight of the readers. Another favorite was an anthropomorphic, talking tiger called Mr. Tawky Tawny, who repeatedly roped the Captain into his schemes to get rich, to become a movie star, and similar escapades. A less successful development was occasional sidekick Steamboat, an unfortunately caricatured African American boy, who was widely denounced by critics and has since been air-brushed out of the comics history books. With such rich material (and an enthusiastic audience) to draw upon, Captain Marvel was among the most merchandised of Golden Age superheroes, probably second only to (him again!) Superman. Throughout the 1940s, all sorts of badges, puzzles, planes, games, clothes, watches, figures, and all-purpose do-dads spewed forth from the toy companies. Fawcett themselves were quick to introduce a Captain Marvel fan club in 1941 and a Mary Marvel club five years later. In 1941, Republic Pictures released the highly regarded movie serial, The Adventures of Captain Marvel, starring Tom Tyler and Frank Coghlan Jr. In his many hundreds of strips, Captain Marvel tirelessly conquered an unending stream of villains, but there was one enemy even he could not defeat—his greatest rival, Superman, and the lat-ter’s litigious publisher, DC Comics. As early as 1939, DC had successfully prosecuted Fox Comics for their character Wonder Man’s similarity to Superman and, as soon as it appeared that the Big Red Cheese was becoming a serious rival, DC turned its sights on him. From 1941 to 1953, Fawcett and DC battled it out in court, earning their lawyers a small fortune in fees before Fawcett threw in the towel, agreeing to cease publishing the character. It could be argued that just about every superhero owed something to the character that started the genre, and that Captain Marvel—of all of them—owed the least to the Man of Steel. However, by this point superhero sales were falling and comics in general were suffering something of a slump, following a media-led witch hunt and the arrival of the Comics Code. So Fawcett decided to shut down its entire comics division, and rather than incur further court costs they settled with DC, and the Captain was doomed to fly no more—or so it seemed. For many years before the lawsuit, Captain Marvel stories were licensed all over the world, and in Brazil and Great Britain (when the licenses ran out in the mid-1950s) comic publishers simply drew their own stories, changing the name of the character. In Brazil the character was called Capitao Marvel, while in Britain he was renamed Marvelman and starred in hundreds of strips well into the 1960s. Back in the United States, however, Captain Marvel lived on in the memories of comics fans, and throughout the 1960s he was a nostalgic figure in fanzines and convention costume parades. No one would have guessed that DC, of all companies, would turn out to be the Captain’s savior, but it was indeed DC that, however ironically, licensed him from Fawcett and began publishing a new series in 1973. DC also managed to tempt C. C. Beck out of retirement to resuscitate the Captain. The only fly in the ointment was that Marvel Comics had in the meantime appropriated the name Captain Marvel for one of its comics, and so the new DC comic had to have a new name; DC happily hit on Shazam! However, what worked so well in the 1940s seemed not to have the same resonance in the more cynical 1970s, and the revival was not the success everyone had hoped for. Beck argued with DC over the direction of the feature, which he said the writers had failed to grasp, and he left after ten issues. He maintained that the original run had dramatic stories that had a humorous treatment, whereas this newer run was all too often played for laughs—and with stories such as “Invasion of the Salad Men,” you could see his point. Still, it did reintroduce the Captain and his supporting and opposing casts to a new generation, and it undoubtedly prompted Filmation Studios to produce a Shazam! television show. The live-action show premiered on CBS in 1974 and ran for several seasons, starring Jackson Bost-wick (and, later, John Davey) as Captain Marvel with Michael Gray as Billy Batson. And a new mentoring character called, of course, Mentor was introduced. While it suffered from a small budget and limited special effects, it had a certain charm and is fondly remembered by fans. What the show failed to do was help sales of the comic, even though for a while the latter tried—to little effect—to reflect the television version, albeit replacing Mentor with Uncle Marvel (a regular of Mary Marvel strips in the 1940s). A further revamp, which had a more realistic, gritty approach to the art, was similarly ineffective, and for many years the strip was relegated to backup status in comics such as World’s Finest. Subsequent revivals in such comics as Superpowers, and Jerry Ordway’s well-crafted Power of Shazam series (which ran for five years from 1995 to 1999), have kept the Captain in the public eye, but have not been enormous successes financially. However, an almost imperceptible shift has granted him iconic status in DC’s lineup of stars, so that he regularly appears as statues, action figures, posters, and books, along with the rest of DC’s characters. Star artist Alex Ross made him one of the central figures of the blockbuster Kingdom Come comic (1996) and in 2000 painted the lavish Shazam—Power of Hope oversized paperback book, including the Captain as one of only four DC characters to be given the honor of such an upscale comic (inevitably, Superman, Batman, and Wonder Woman were the others). Some stories in the main DC universe continuity involving Captain Marvel and the Marvel Family in the early twenty-first century, such as The Trials of Shazam (2006–2007), tend to have a grim, dark, adult tone like so many contemporary superhero sagas. In welcome contrast, the miniseries Shazam: The Monster Society of Evil (2007), written and drawn by Jeff Smith, the creator of the highly acclaimed comics series Bone, presents an alternative, child-friendly version of the Captain Marvel mythos that recaptures the whimsy and charm of the Captain’s 1940s stories.